Setting: Camelot; later western Cumbria. Your campaign should allow the existence of Old Heathen magic. Problem: The court has heard of droughts and terrible disasters in Cumbria. Rivers have dried up, the ground shakes, and strange beasts stalk the hills. Citizens are miserable. There seems little that the knights can do to help, until one May afternoon a strange knight wearing a fur cloak rides into Camelot. Visiting the King's Court, the knight greets King Arthur courteously. However, the knight keeps his right hand hidden under his cloak. He tells his tale in a hollow, halting voice: "I bring greetings and a challenge from Mirhut, who owes fealty to no mortal man. I rode on a venture through the forests of Cumbria and by night happened on the domain of Mirhut, a place of old magic. A strange warrior appeared and bade me fight for my honor and my faith. Naturally I would so. "I said I would not. Mirhut said, 'Valiant knight, to forego my will requires great spirit. If you have the courage to place your right hand in my mouth, I will release you.' I did so." "The evil Mirhut has vowed to lay waste to the land of Cumbria by Midsummer Eve, until it gains a new vassal or a mortal man defeats it. Knights of Camelot, will any among you dare this venture?" Characters: The Knight Sinister. Use the Notable Knight statistics (p. 192, 3rd Ed. ; p. 329, 4th Ed. ), and later the Faerie Knight statistics (p. 203, 3rd Ed; p. 341, 4th Ed.). However, for obvious reasons the Knight Sinister carries no shield. Another Faerie Knight, with shield. Mirhut. This primeval forest spirit usually requires no statistics. Its wolf form is uncommonly large and fierce; use the Panther statistics (p. 204, 3rd Ed. ; p. 342, 4th Ed.). 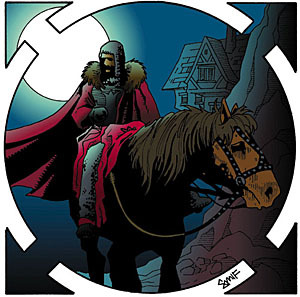 Secrets: The Knight Sinister keeps a secret - that he is, in fact, the vassal of Mirhut. By an enchantment, Mirhut has bound the honorable knight to tell this deceitful story. In truth, the Knight Sinister lost his battle with Mirhut's vassal, who was a Faerie Knight. The penalty for defeat was the loss of his hand, as well as vassalage and this enchantment. Mirhut is using the Knight Sinister to lure more knights to Cumbria, where they too will become its servants. Solutions: King Arthur sends a small delegation of volunteer knights (the player characters). The Knight Sinister guides the knights north to Cumbria, a journey of many days. If any adventures occur on the way, the Knight Sinister fights beside the knights of Camelot, with honor but no great prowess. Yet as the knights near Cumbria, the Knight Sinister appears to fight with greater mettle. But in the aftermath of battle, he grows melancholy. He cannot say why. The knights enter the Cumbrian forest. Regardless of the time of day, the sky darkens to night. Owls call and bats fly in the moonlight. The Knight Sinister leads the party into a clearing. Then a giant white wolf pads into the clearing. From nowhere, a voice like the wind in the trees announces, "You are in the realm of Mirhut. The old law rules here. On your honor, you must join my vassals or fight them." Presumably the knights choose battle. The Knight Sinister, now filled with power (use the Faerie Knight statistics) but quite sad, raises his sword against the knights of Camelot. "It is my doom," he says, "since I lost to my old opponent." Beside him, another Faerie Knight joins him. Victory: To defeat Mirhut and restore Cumbria to health, the knights of Camelot must defeat both Faerie Knights in a free-for-all melee. If they succeed, the wolf and the Faerie Knights whisk away on the wind, and sunlight breaks from behind the clouds. Failure: But should the knights fail, Mirhut offers them the challenge it offered the Knight Sinister: To go free, they must place their sword hands in the wolf's mouth. Knights who agree receive a Valorous check. Knights who disagree but leave anyway lose -3 from their Honor and gain no Glory in this adventure. During the adventure, a knight received a Critical Success. "Valiant knight, I will not take your hand," says Mirhut. "You are too fine a warrior, and the loss would bring me no joy." The character has received a Chivalry Bonus. "Valiant knight, I will not take your hand," says Mirhut. "You are the finest flower of the new law. Continue your career, that I may know the virtues of these unfamiliar ways. The character has received a Religious Bonus. The wolf attempts to bite the knight's hand, but some force prevents it. The wolf growls in frustration. Other reasons to spare a knight's hand include high Glory, a fierce Passion, or a predestined role in some later adventure such as the search for the Holy Grail. A dishonorable knight, however, may actually lose his hand. This is a Mortal Wound. The knight automatically survives (the wound heals almost instantly), but he is probably ready for early retirement. He may be persuaded to remain here as Mirhut's vassal. Aftermath: Once the testing is complete, the Faerie Knights vanish and the wolf leaves the clearing. Sunlight returns. If the knights defeated Mirhut, or Mirhut found a new vassal, Cumbria returns to life. Otherwise, the poor people of this land continue to await deliverance. Glory: 200 for defeating each Faerie Knight, plus 100 for restoring Cumbria. Each knight who survived Mirhut's test with hand intact receives an additional 50 Glory.